France’s capital may be the world renowned for the invaluable pieces of art that reside in such museums as the Louvre and Musée d’Orsay, but it is also home to some of the most exciting street art in Europe. 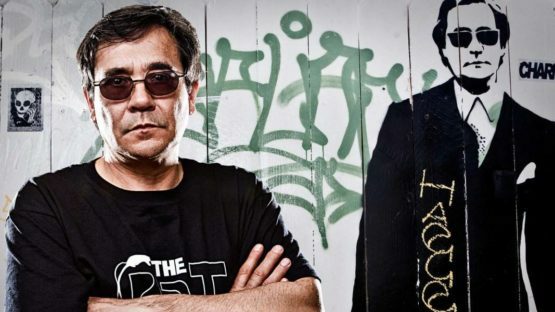 One of the first artist who started decorating the streets of the City of Light was legendary graffiti artist Blek le Rat who has inspired generations of graffiti artists across the globe. The true pioneer of street art, he is often cited as a major influence of artists like Banksy, Space Invader, Shepard Fairey, and Icy and Sot. Through his work in his hometown, the artist established a style of urban art that rapidly spread throughout the continent and beyond. The father of stencil graffiti, Xavier Prou was born in Boulogne-Billancourt, a commune in the western suburbs of Paris in 1951. He studied fine art and architecture at the prestigious École Des Beaux Arts in Paris, graduating in 1982. Before his graduation, Prou visited New York and developed a fascination with the city’s street art. 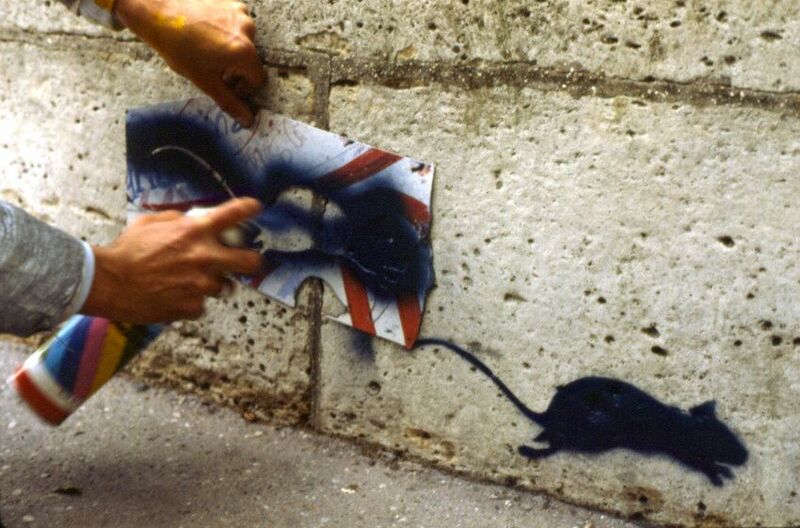 Inspired by the NYC graffiti, he returned to France and began his artistic career in 1981 by painting stencils of rats. What he did that no one artist in France had was the utilization of pre-stenciled posters and images allowing the application of paint to be a lot speedier, mostly because he didn’t want to stay a long time on the streets because of the police. His black painted rats which began to appear on the street walls of the city would mark the beginning of the transformation of Paris’s visual landscape and identity. His pseudonym, Blek le Rat, originates from a childhood cartoon “Blek le Roc”, using “rat” as an anagram for “art” because, for him, the rats symbolized both freedom and the spread of art throughout the city as an invasion. In the early 80s, American artist Richard Hambleton came to Paris and brought his work over from the US. By that time, Blek was already making rats, but when he saw Hambleton’s large shadow human figures, he got the idea of making bigger pieces, so he soon began doing larger works, as well as self-portraits. Today, Blek is credited as the first to transform stencil from basic lettering into imagery, and the one to invent the life-sized stencils. He creates most of his stencils by hand, crafting each to perfection to allow for the best detail possible upon application, and works mainly in black and white. 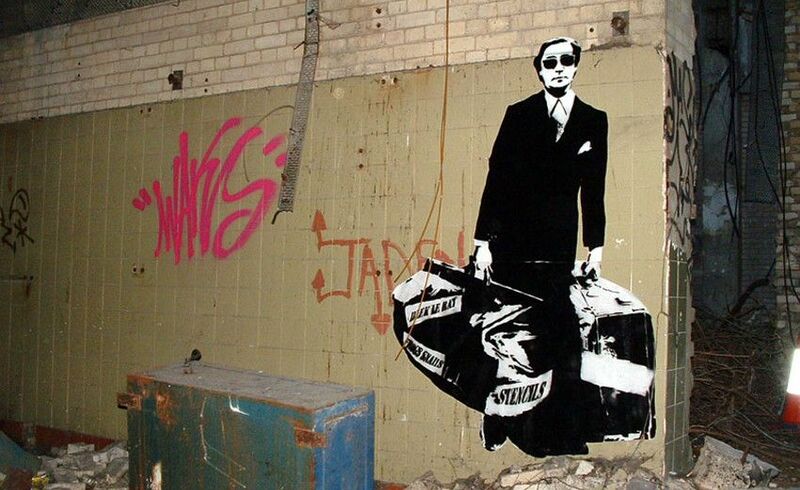 Ten years after he made his first piece, Blek le Rat was eventually discovered and caught by the French authorities. He was charged and fined for stenciling his own version of Caravaggio’s Madonna and Child onto a wall in Paris. This image is Blek le Rat’s oldest remaining artwork, and it depicts a woman called Sybille. Blek le Rat had fallen in love with Sybille and decided to proclaim his feelings to her by spray painting her image while interpreting Caravaggio’s notorious piece. Luckily, this love story has a happy ending, as Sybille and Prou are now married and have a son. 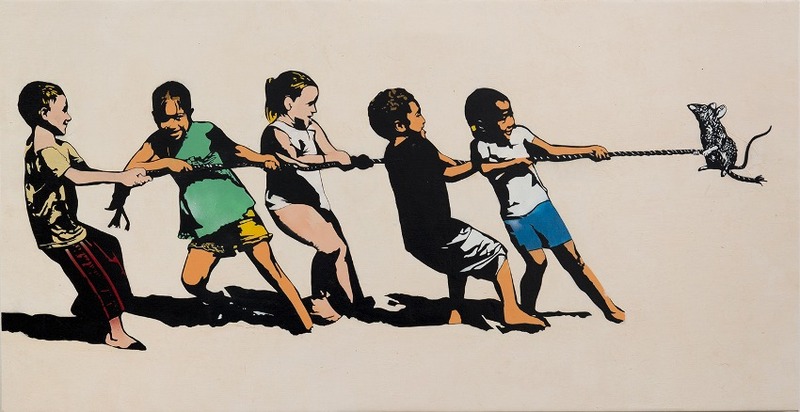 Over the years, it seems that the subject of Blek’s depictions has changed a bit – he is more focused on questions that regard social consciousness, politics, and environmental problems. He creates socially engaged artworks, intended to bring attention to global problems, often depicting marginalized individuals opposed to large oppressive groups. He has also been noted for his series of images of homeless people, begun in 2006, which depict them standing, sitting or laying on sidewalks, in attempts to bring attention to what he views as a global problem, to provoke thoughts, and even actions. 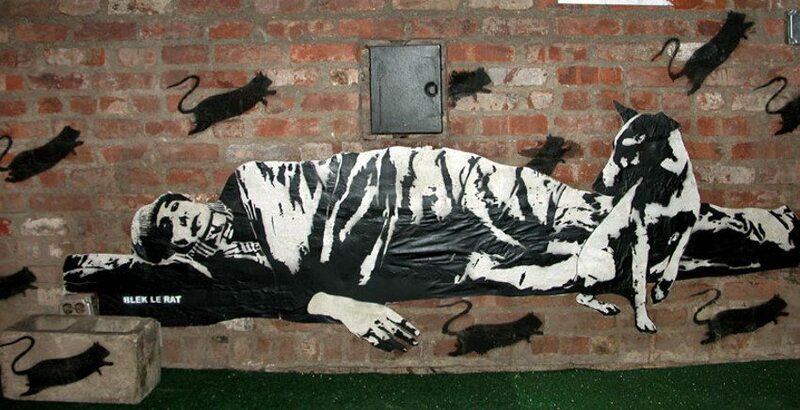 Popular opinion believes that Banksy was greatly influenced by the work of Blek le Rat, which shares a similar style. With the impressive career that spans over three decades, Blek le Rat continues to influence many street artists and to amaze us all to this day. He remains one of the most referenced artists by other artists, and his contribution to the movement is invaluable. In the past decade Blek’s popularity has become more mainstream and in 2006, Blek showed his works in London’s Leonard Street Gallery. Since then, his oeuvre has been included in numerous individual and collective shows in galleries across the globe. 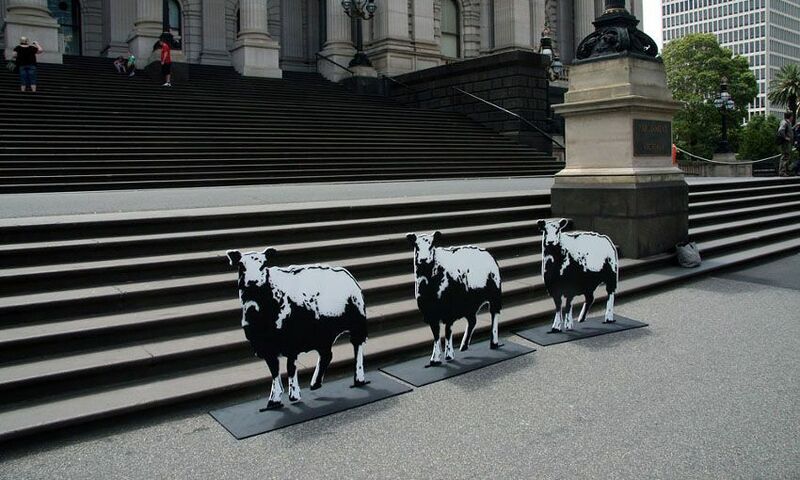 That doesn’t mean he has stopped the street art, his graffiti work has continued to appear throughout the world. The French artist is represented by Vertical Gallery in London; Ministry of Walls, Cologne; Hang-Up Gallery, London; 44309 Street//art Gallery, Dortmund; Wunderkammern, Rome; Wunderkammern, Milan; Jonathan Levine Gallery, NY; and Artsuggest.com. Blek le Rat lives and works in Paris.